Ishaan Khattar A Part Of Student Of The Year 2? Karan Johar Reveals! Ishaan Khattar has rumoured to be a part of Karan Johar’s Student Of The Year 2! Karan Johar‘s Student Of The Year proved to be a great platform for launching the new faces Alia Bhatt, Sidharth Malhotra and Varun Dhawan in the industry. When the filmmaker announced the sequel of the film, it was being guessed that some new faces will be launched by KJo this time as well. And one of those was guessed to be Shahid Kapoor’s younger brother Ishaan Khattar. Ishaan, already famous as the popular actor’s brother, has been considered to be amongst the top choices of the filmmakers of the industry when it comes to young actors. In fact, very recently Ishaan was called as a star kid by a reporter. Read here A Reporter Called Ishaan Khattar A Star’s Son, Here’s How He Reacted! A few days back, Karan had shared the first poster of the film revealing that Tiger Shroff is the first student. And it was after that there were many reports doing the rounds of media about Ishaan also being roped in for the film. 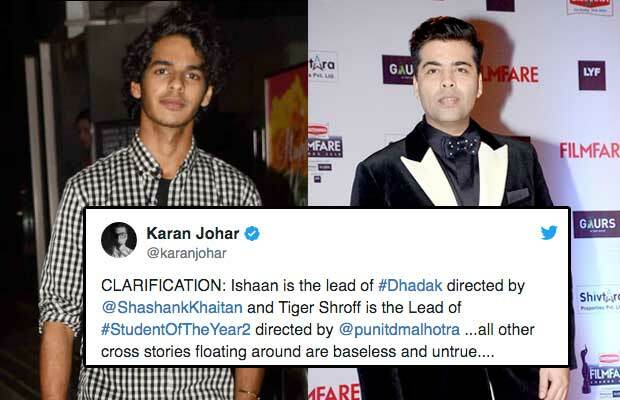 CLARIFICATION: Ishaan is the lead of #Dhadak directed by @ShashankKhaitan and Tiger Shroff is the Lead of #StudentOfTheYear2 directed by @punitdmalhotra …all other cross stories floating around are baseless and untrue…. Apart from Ishaan, Chunky Pandey’s daughter Ananya Pandey has also been reported to be a part of the film. Earlier names like Jhanvi Kapoor and Sara Ali Khan were rumoured to be launched with SOTY 2. But since Jhanvi is busy with Dhadak and Sara is busy with Kedarnath, it is most probably to see Ananya in the film. Talking about Ishaan Khattar, he will be seen in Dhadak, the Hindi remake of the Marathi hit film Sairat. Next articleWatch Video: Look How AbRam Khan Got Chatty With Daddy Shah Rukh Khan!